A dual laser fork guidance system significantly reduces the chances of damage to goods stored on pallets by helping to visually guide forklift drivers as they pick or store pallets. The system helps reduce the chances of tines breaking open bags, punching holes in cartons and damaging the goods inside. 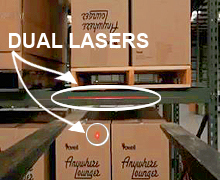 One laser light aligns with the fork tines and shines on the pallet in front of the forklift, providing a guide line showing the forklift operator the position of the tines at all times. A second light provides visual confirmation of where the forks are in relation to the pallet rack, visually guiding operators to help avoid a rack collision. 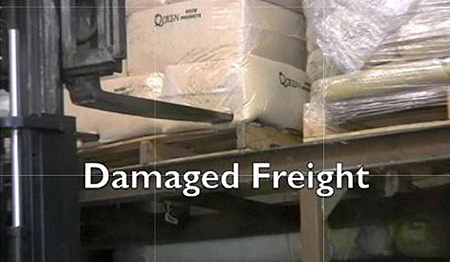 Speeds the rate of pulling pallets out of pallet rack. Fits Class II carriages; other carriage types available upon request. Battery operated; rechargeable batteries. Powers on when forks are above 7' high to prevent laser light from flashing into workers' eyes. Dual laser tine guide systems shine both a line and dot for extra fork positioning guidance compared with a single laser system. The top laser aligns fork tines with pallet fork slots to prevent damage to goods, and the bottom laser aligns forklift with pallet rack beam to avoid damage to rack.